The following article originally appeared in the Indian Express on March 18, 2015. An excerpt is included below and the full article can be accessed here. The future of single-party rule in China ought to be of major concern to India. China is among India’s largest trade partners and the two countries collaborate closely on various multilateral issues. At the very least, China’s political fortunes will have implications for the global economy, with which India’s future is closely intertwined. China alone was responsible for a third of global growth last year and remains an important driver of international commerce and finance. At the same time, the border dispute remains a serious test of bilateral relations between China and India. The relationship between the CCP and the People’s Liberation Army (PLA) means that there could be uncertain, and potentially severe, security implications for India should the CCP disintegrate or lose its hold on power. 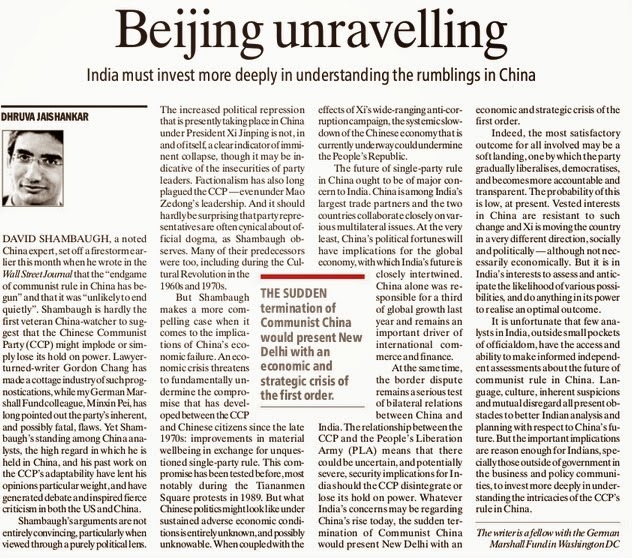 Whatever India’s concerns may be regarding China’s rise today, the sudden termination of Communist China would present New Delhi with an economic and strategic crisis of the first order. Indeed, the most satisfactory outcome for all involved may be a soft landing, one by which the party gradually liberalises, democratises, and becomes more accountable and transparent. The probability of this is low, at present. Vested interests in China are resistant to such change and Xi is moving the country in a very different direction, socially and politically — although not necessarily economically. But it is in India’s interests to assess and anticipate the likelihood of various possibilities, and do anything in its power to realise an optimal outcome.